Home / FAQs/ Welcome to All New Members. Here’s just a little information to get you started. Patriot Guard Riders, Inc is an international organization. You join through national and usually associate yourself with one state. Some states have separated to create their own non-profit corporations but Wisconsin is part of the national organization. If you haven’t joined yet, go to the national website at www.patriotguard.org and click on the menu option that says Login/Join. You MUST complete the fields so we include you in mailings. 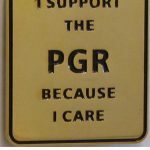 After registering and logging in, select the menu option Members -> Subscribe to PGR MIssions. You must select Wisconsin listed under region or you will not get statewide e-mails. If you have registered with national, please also take just a moment to send me: last name, first name, username, e-mail, street address, city, state, zip, and phone. We are attempting to keep backup information as our national database has been overwhelmed, it was designed for the lofty goal of 10,000 members, and we are near 285,000 and growing. Once you have joined through the national web site www.patriotguard.org and log-in (I suggest you click the box for auto login) , you can then go click the Go to your Home State Page to bring you to this page. We have a dedicated web site at www.patriotguard-wi.org. The national site is still the official word but our site includes only items of interest in Wisconsin and the events listed there take you directly to the correct spot on the national site. You must be signed in to national to be taken to the right information. I suggest you sign in to the national site and click the little box that says [ ] Remember Me. Afterwards you can go directly to the Wisconsin state page. If you have any software that “cleans” your machine or if you delete cookies this will be deleted and you’ll have to sign in (and click the box) again. As far as finding missions, it’s actually simple. First, when a mission is confirmed, I have an e-mail sent to everyone in the state. Second, they are listed on our web site and, for the national site, you can go to Members -> Upcoming Missions and use the tags to filter for Wisconsin, or you can go directly to the Wisconsin State Page, and see a listing of the upcoming and recently completed missions. There are two things to do to stay informed of events in Wisconsin. I suggest you log-in and select Members -> Subscribe to PGR Missions and subscribe to Wisconsin missions. You should also watch our web site or the missions listed on the right side of the state page. I do issue a “Statewide Email” to announce missions when they are confirmed. In order to get into the member forums and respond to any events you must be a member and can only respond on the national site. If you are sent an e-mail with a link and it does not take you to the right place, you probably are not logged in. Many new members ask about our “ride schedule” or meetings. If you have read the Mission Statement on the national site, you will notice that we are a service organization providing honor guards and escorts at the funerals of the fallen and providing other support for all active military and veterans as we have resources, therefore we don’t do rides or meetings separate from our Missions and Events. We do have a number of events that you will find on the web site from “Meet and Greet” gatherings to participation in other events like Veteran’s recognition events but we are not a “motorcycle club” so being in a van, car or truck is great. We also have a definite need for support vehicles that could carry flags (we have extras in every region) and a cooler with water in the summer and eventually some simple tools and first aid kit. If you can occasionally help a stranded member, even if it’s only directions or getting them help on the road, please sign up for the Red, White, and Blue Book. Check the Wisconsin Forum for information. I’d like to create a “WI PGR owners manual / frequently asked questions” so if there is anything that confused you when you started (or still does today) let me know so we can address it. I still have alot of people that don’t know about forums and mission threads. Support vehicles – so many feel bad about “caging it” driving a car, truck, or mini van. WE NEED YOU more than you know. We still need a lot of people who would be willing to bring the extra flags and water and possible tools and first aid kits to a mission. Been a member of patriot riders for a long time been out of service. Wanting to get back in with my brothers.